I still had half of an eggplant left from dinner. and served with scrambled eggs. Sounds unusual but really good! I should try to think out of the box once in awhile! Love the Asian sauce....spicy is good! This looks incredible. 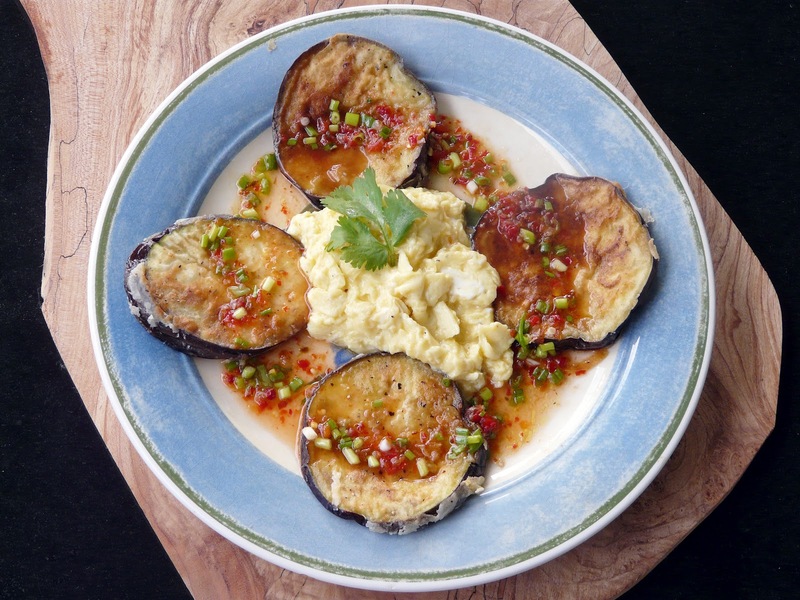 I love eggplant and never thought about paring it with breakfast. This will be on my to do breakfast list. One of my favorite snacks is leftover cold fried eggplant. 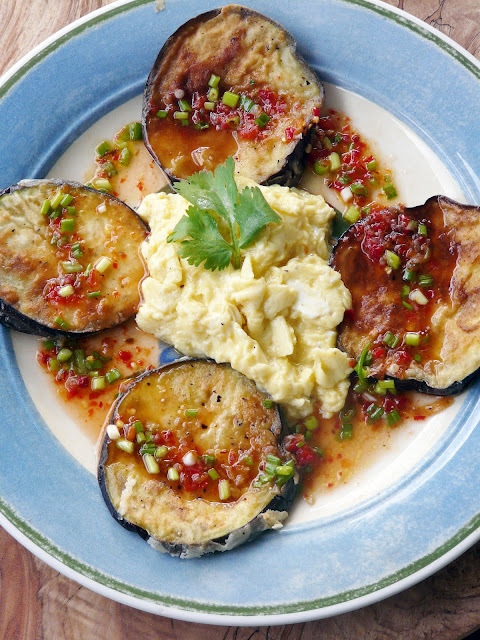 I've loved fried eggplant since I was a kid, and I think it might be my favorite way of eating eggplant. Ann, I'm really curious about soaking the slices in milk. I've never done that. Does it help with bitterness or the tendency to absorb so much oil when frying? How long do you soak the slices? And, finally, do you use an egg wash or just go from milk to dredging in flour? I'm heading out to the farmers market tomorrow morning and plan to pick up some eggplant. 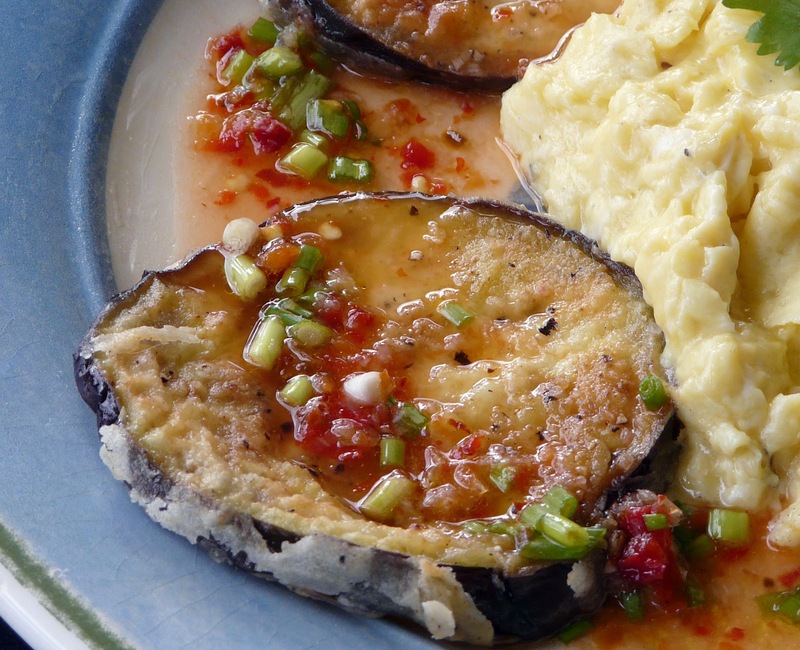 Your pictures have got me craving a platter full of fried eggplant slices. Maybe I'll be really daring and make some skorthalia to go with it! Sue, This is the first time I've tried the soak in milk method. You can soak it over night, but I soaked it for just two hours. Then dredged it in seasoned flour. It produced a lighter coating than my usual method of the egg wash and flour. The milk is suppose to reduce bitterness, but I have always found that if I buy small fresh eggplants,that they are not bitter and that there is really no need to presalt. The eggplant did not absorb oil, which I assume is another side benefit of soaking in milk. Both Moe and I really love eggplant. I need to cook it more often. Thanks, Ann. 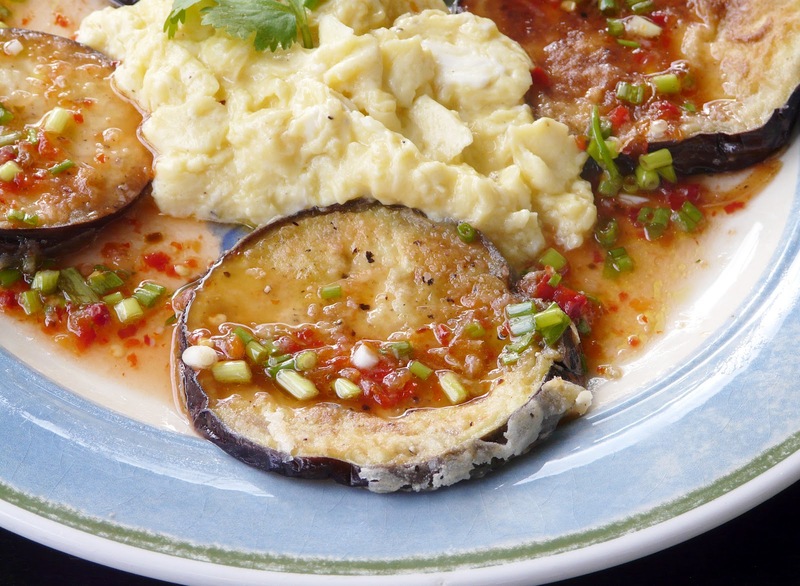 Now that I think about it, I don't think my mother ever did an egg wash with eggplant. Maybe the soak would produce the best of both worlds, so to speak. My mom knew me very well. When I'd come home from college, she would always have fried squash patties, fried eggplant, and spanakopita waiting for me. Now that's love!